If my hands aren’t firmly planted at 10 & 2 on a steering wheel, they’re firmly planted on a keyboard. My love for cars and of writing has led me to meet lots of folks who share those passions. Earlier this year, I became a member of the Phoenix Automotive Press Association (PAPA). As a jury panel member for a vehicle-of-the-year program called Active Lifestyle Vehicle of the Year (ALV), I will get the opportunity to evaluate cars based on how well they perform for ‘active’ people. In the future, I will occasionally bring you new car reviews (including, of course, for new Acuras). 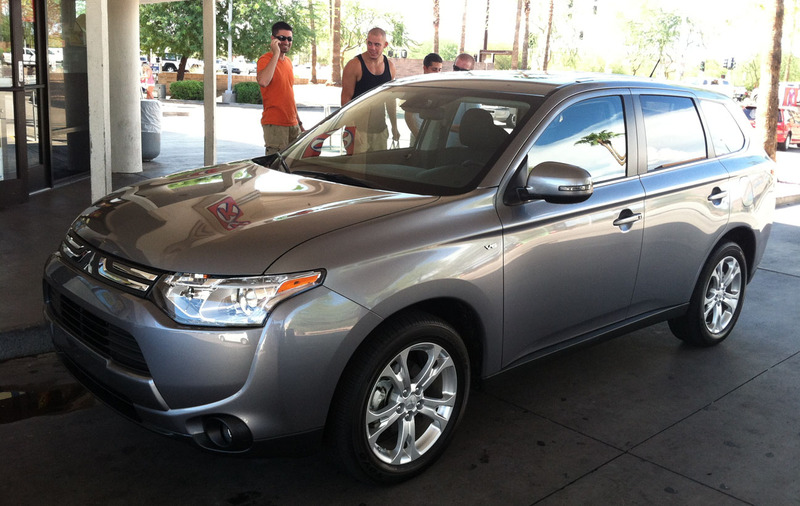 First up: the 2014 Mitsubishi Outlander GT crossover. I’ve always had a special place in my heart for Mitsubishi. When I was 16, I detailed cars for friends & neighbors. One of those cars was this Galaxy White Pearl 1992 Diamante. I especially loved the front end, the dash dash design, and the exhaust note — not to mention those great frameless windows that mimicked a ‘convertible’ feel when you opened the doors. In later years, I was obsessing over my friend’s red 3000GT VR-4, pictured below. Twin turbo, full-time all-wheel-drive, 6-speed transmission, and 320 horsepower. The 3000GT became one of my favorite sportscars. But where is Mitsubishi today? My friend Ian knows the answer. He’s been driving a 2012 Lancer that he absolutely loves. As for me, the last decade has been filled with Hondas so I haven’t paid enough attention to what’s going on at Mitsubishi. As I’ve learned this past week, the company is still very much alive and well. I bring you the company’s latest creation: Outlander. 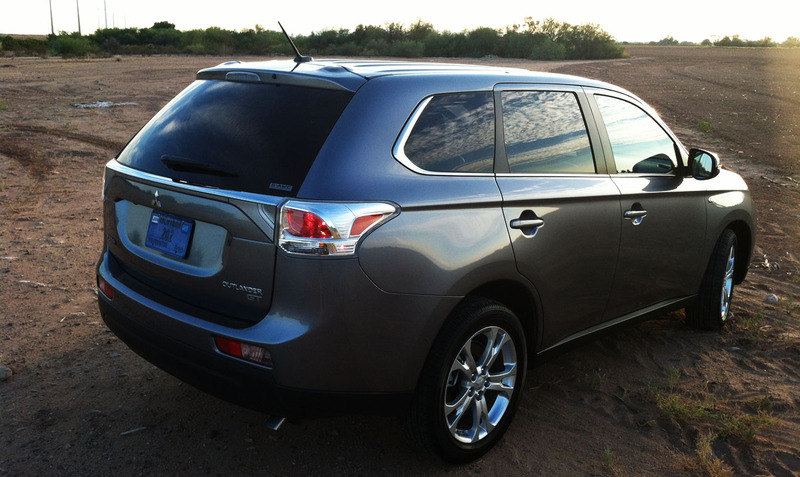 This vehicle is now in its 3rd generation with an all-new redesigned model for the 2014 model year. I had the opportunity this week to put some miles on a GT S-AWC model finished in Mercury Gray with black leather interior. I wonder what the neighbors thought when they saw a non-Acura vehicle in my driveway. They were probably relieved to think that my obsession with Acura had subsided. One of the first things I noticed about the vehicle was the prominent V6 badge on the front fender. Outlander ES and SE come equipped with a 166-horsepower 2.4 liter 4-cylinder and Continuously Variable Transmission, while my GT model had the 3.0 liter V6 engine and a 6-speed automatic transmission. This powertrain is rated at 224 horsepower. 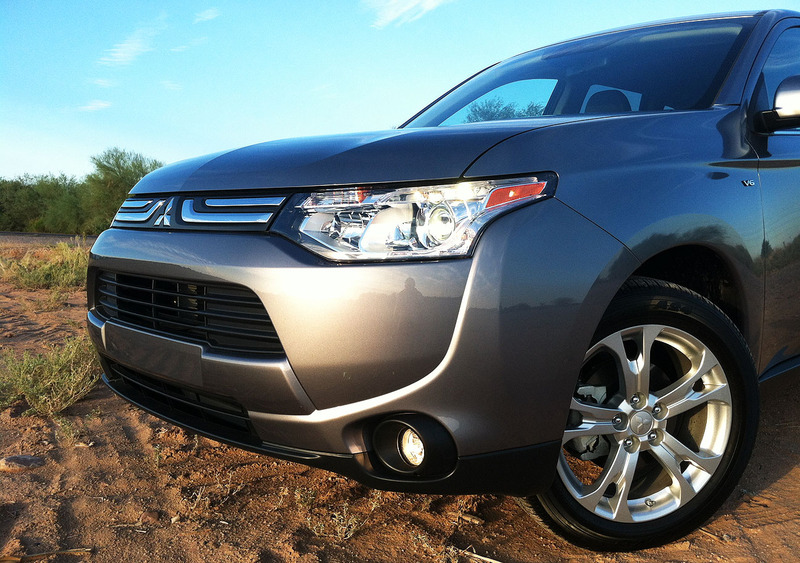 Overseas, the Outlander can be equipped with a manual transmission. Design wise, in my opinion this crossover is most handsome from the rear 3/4 angle. 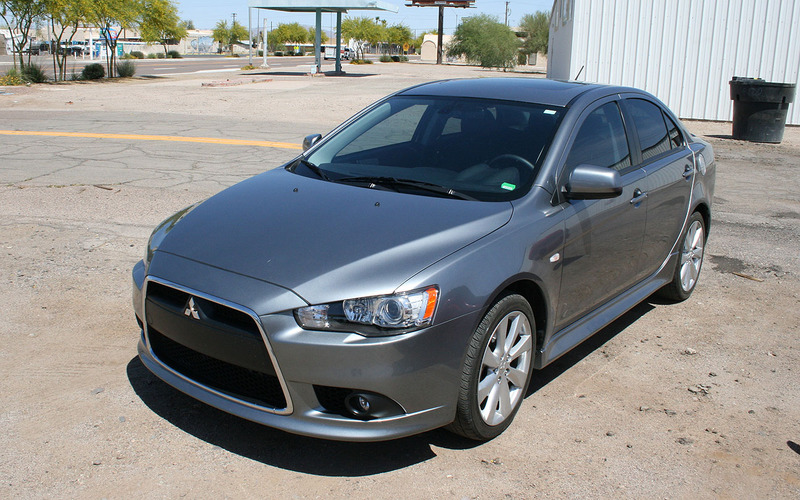 The front end features Mitsubishi’s “super wide” High Intensity Discharge (HID) headlights, and foglights integrated into the lower bumper area. The new-for-2014 chrome mustache grille is eye-catching, and not in a good way. Right away, I found a huge win for the Outlander: UTILITY. As a “car person,” I’m not accustomed to having such plentiful space, versatility, and go-anywhere capability. Outlander has space for everything. Twice this past weekend, I had the chance to put the Outlander’s people-hauling capability to the true test. 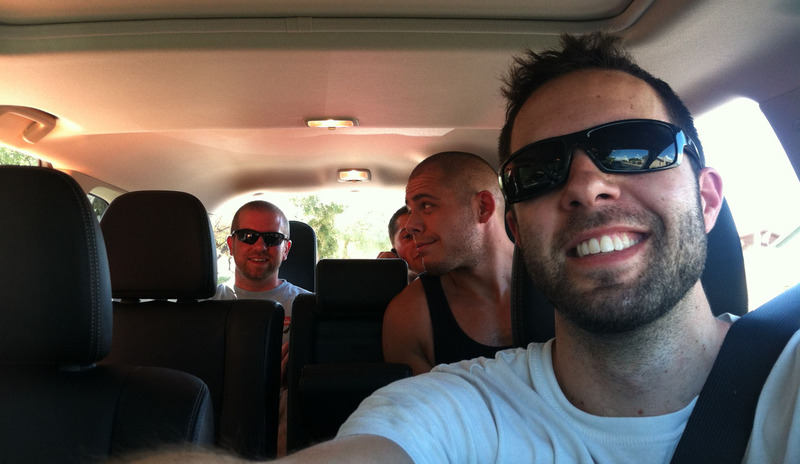 Six of us hopped in to run an errand to AutoZone on Saturday, and then 5 of us went to dinner on Sunday. Third row seating allows the vehicle to accommodate a total of 7 passengers, and when not in use, the third row folds flat for maximum cargo area capacity. 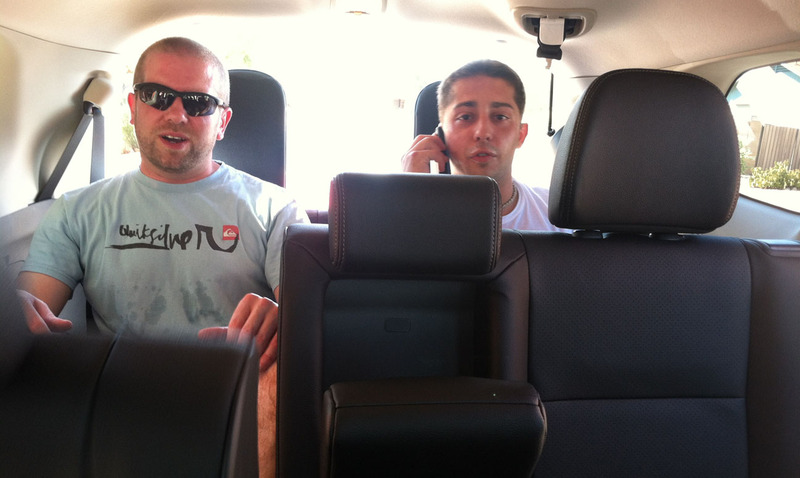 Brian and Tom took the two seats in the far rear. 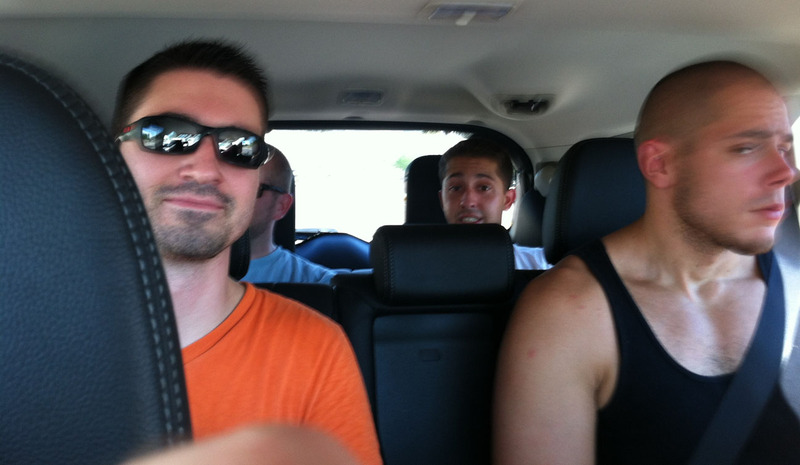 My back seat passengers did express the fact that they did not have any A/C vents in the rear. Since it was 100-degree day and the Outlander had been parked outside, it was toasty inside and the front vents couldn’t keep up with the need to keep the entire cabin cooled. Then, when they resorted to rolling the windows down instead of waiting for the A/C to cool things down, they were disappointed that the windows don’t roll all the way down (the glass stays above the door panel slightly so you can’t rest your arm on the panel and dangle it outside. Safety feature?). 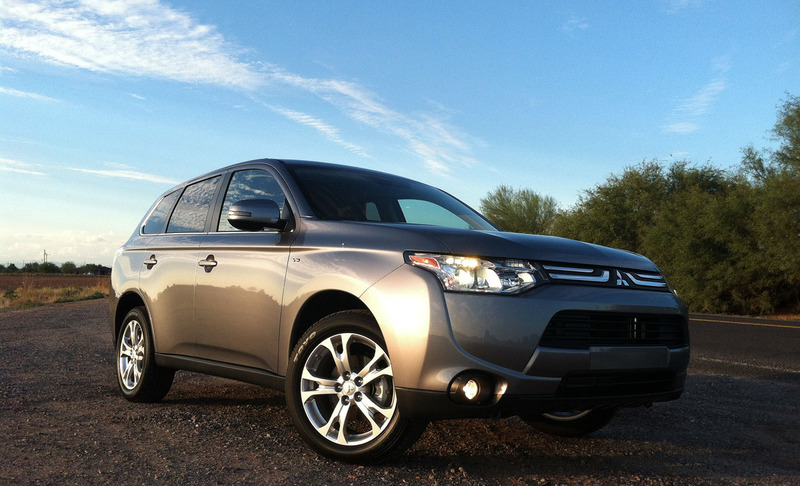 For the rest of my feedback on the Outlander, I thought it best to summarize in list form. Auto- up/down power window is on the driver’s window only. No rear air vents – for a 3-row SUV, this is behind the times. XM reception is poor. Audio cuts out occasionally, even without a bridge or obstruction overhead. Volume knob is small. Something so frequently needed should have a larger presence on the dashboard. Center console is hard plastic and the cup holders are too far forward. The should be moved back toward the driver, and the S-AWC button could be repositioned elsewhere since it isn’t likely to be used very often. Styling of the front end isn’t my favorite; it would be better without the chrome whiskers. The ECO gauge in the cluster isn’t really helpful. The green bar dances around erratically and makes it tough to tell what it’s actually trying to tell me. Can’t scroll to change “MODE” on radio while the vehicle is in movement (i.e. XM to AM to FM). My left leg got bored. I know this vehicle is offered as automatic-only (as are others in its class), but I just can’t enjoy a vehicle quite as much when I’m not kicking at a clutch pedal. Power on tap. Plenty of low-end torque. I’d love to see this thing crawl up some red rocks in Moab, Utah. Transmission gearing. I’m glad this one doesn’t have a CVT. 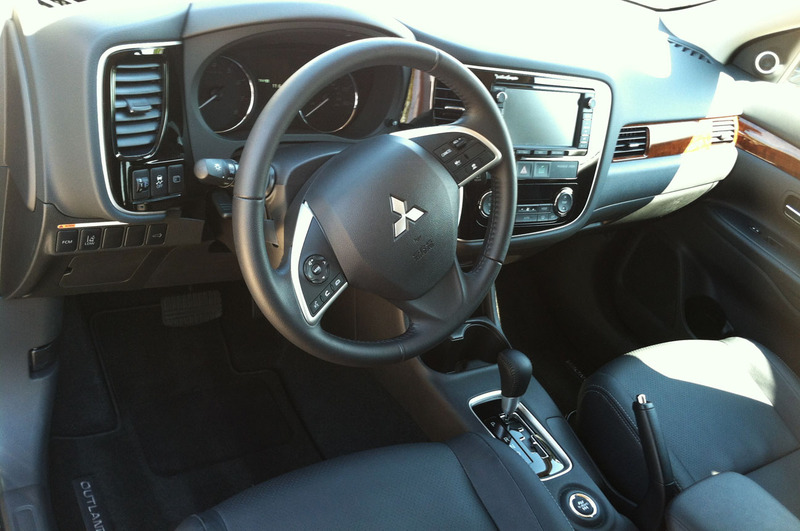 Manual gear changes with the steering wheel-mounted paddle shifters were quick and responsive. Turning radius. For a larger vehicle, the Outlander can U-Turn well. Adaptive cruise. This would’ve been really handy on my cross-country trip to North Carolina a few weeks ago. You can set the preferred distance between the Outlander and the vehicle it’s following. Stereo. I enjoyed the Rockford Fosgate system. The built-in subwoofer packs plenty of punch. In fact, I had to turn it down a bit. Tech. Navigation system is decent, but not totally intuitive. Lane Departure Warning is handy, too, though I turned it off because the audible warnings became bothersome. The two 12-volt accessory outlets are nice. Visibility. Nice all-around view of the road from the driver’s seat. Ride height. I like the step-in height and the “presence” of having a higher-up vehicle. Ride quality. 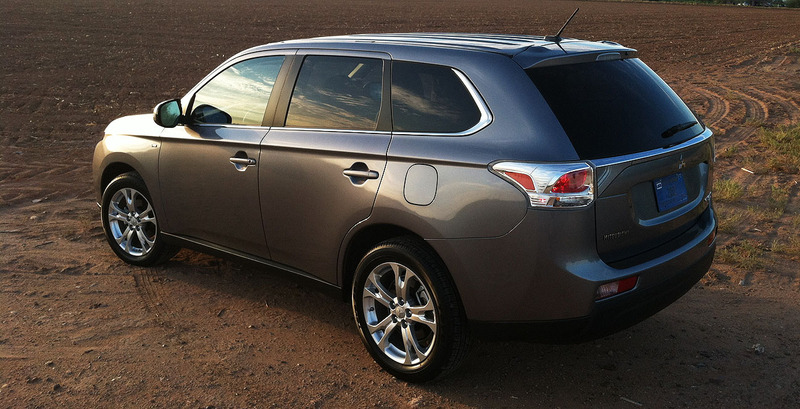 Even when fully loaded, the Outlander was composed on rougher roads. Also, it didn’t feel like it had a ton of body roll, which is impressive for a higher profile vehicle. Safety. In all, there are 7 airbags in the vehicle, including one for the driver’s knee. Leather look & feel was very nice, and I liked the glossy ‘piano finish” of the instrument panel trim. Even the steering wheel feels refined. Nice fit & finish. 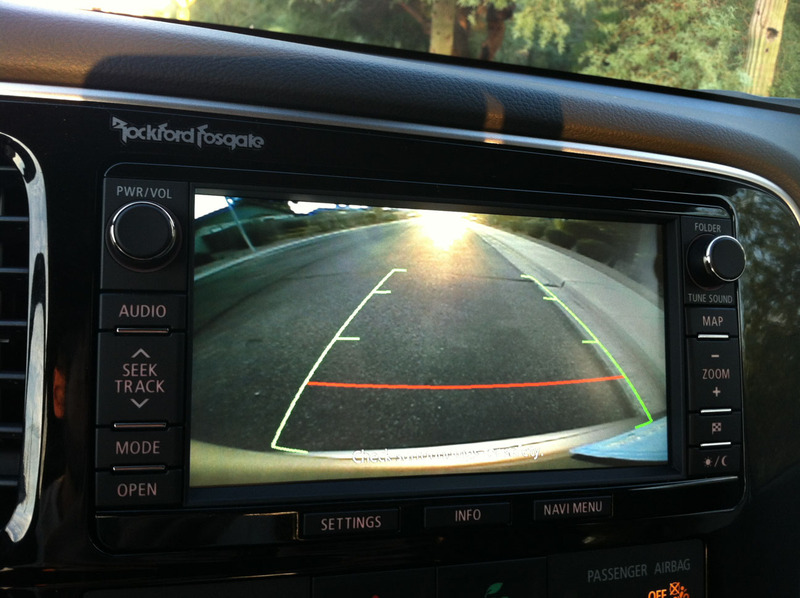 Nice back-up camera here on the 7″ screen, with trajectory lines for ease of parking! Overall, the Outlander delivers where needs to. From a utility, power, and technology perspective, it hits the mark dead-on. With a few small improvements, this would be the perfect crossover for someone who needs a nice ride on the pavement and the capability for an occasional off-road adventure. For anyone looking for a nice value SUV in the low $30’s, this is worth taking a peek at. Many thanks to Mitsubishi for the vehicle loan! The ILX got some junkyard duty today as I went seeking some Legend parts. I’ve got a fun drive planned with the ILX tomorrow with friends to the Pima Air & Space Museum near Tucson, Arizona. Stay tuned for a write-up on that in the coming days. Meanwhile, enjoy these new videos of my younger brother Bentley’s 527-horsepower BMW M3 Turbo 6-speed. I won’t be challenging him to a race in any of my Acuras any time soon. Drag racing, this morning in St. George, Utah. Fastest run was a 12.80 second quarter mile at 120 miles per hour. Makes me wonder what he could do with the ILX if I turned him loose with it (and had an unlimited budget for upgrades, of course). This entry was posted on September 21, 2013 at 4:40 pm and is filed under Vehicle Reviews. You can follow any responses to this entry through the RSS 2.0 feed. You can leave a response, or trackback from your own site. If you’re evaluating “rides” for active people, which make and model would best fit the needs of a runner? How about an artist like your aunt? Or a biker? You guessed it. Paul & Claudette! Loved that Diamante. The ALV program does indeed evaluate vehicles to find the best ones for runners, bikers, kayakers, and anyone who has an ‘active’ lifestyle. The event will be held on 10/19/13 and we’ll have about 100 athletes evaluating 30 vehicles that were entered by manufacturers for the competition. I’ve always been a huge fan of the 3000GT myself. GMTI I guess! Now hop into one of those Nissan GT-Rs and let me know what you think!! Ooh, now you’re talkin. I don’t think I’ll get my hands on a GT-R any time soon, but the next test vehicle I get to review is a $70k Mercedes-Benz E350 Wagon. I think I’ll have some fun with that one. Stay tuned.